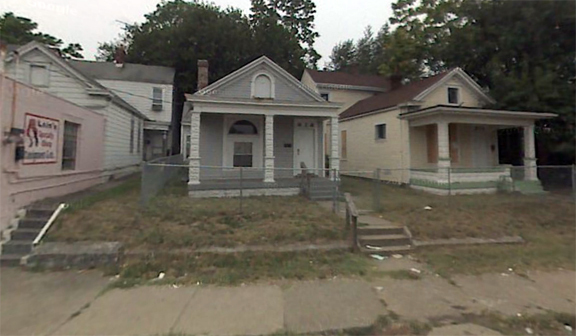 My childhood neighborhood | THE RAVING PUNDIT: HOW I GOT SO SMART (IN MY OLD AGE)! Nine years ago, on July 27, 2003, I wrote an article for my very best friend, ever, Gladys’ birthday celebration. It was a memory piece about the neighborhood we grew up in. I decided to write this blog from the memories I shared in that paper. It may not be familiar to my blog readers because it is not your neighborhood, however, we all have memories from our neighborhoods and maybe you might relate to mine and remember yours. A picture painted from Broadway to Oak Streets follows. 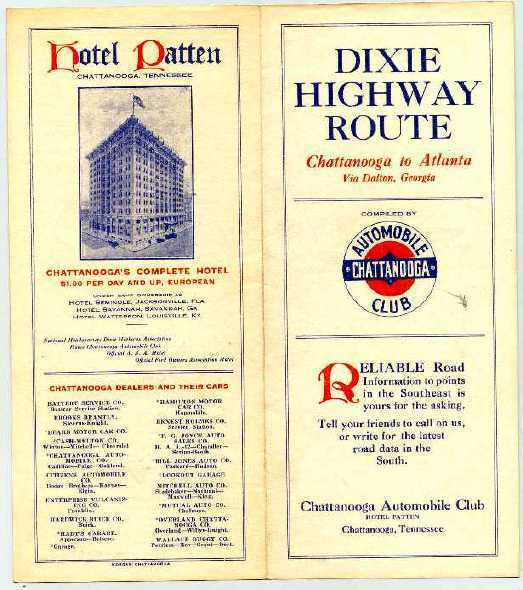 Dixie Highway was the Highway to the South. Travelers heading south to Tennessee, Georgia, Alabama and Florida came through Dixie Highway. The interstate highway systems had not been built. Between the approximately twelve blocks from Broadway to Oak Streets a lot of living took place. We had just about every kind of business. Dry goods, barber shops, saloons, groceries, a five and dime store, a fruit stand, meat markets, picture shows, an optician, a hardware store, auto repair garage, road paver, a distillery, a night club, a notary public, and, I am sure, some I have missed. We had a smattering of churches, and, from time to time, gypsy palm readers, a hot tamale cart with its Italian pusher shouting “Hot Tamales two for a dime, a nickel a piece.” A vegetable peddler with horse and wagon, and paper boys yelling “Extra, Extra, read all about it”, “Hauptmann electrocuted”, “John Dillinger killed” – any news of great importance. That was how we received our “late, breaking news” of the day. There was a diverse population on those streets: Irish, German, Italian, African- American and very few pure blooded Americans. Most of the older members of Dixie Highway spoke their native tongue, especially when angry. We had our share of characters: Lefty Erlanger the Gambler (owner of the Club Rialto), Grover the Schrieber’s Drug Store delivery boy, Weller the meat market Romeo, Rosie Miller – a recluse with money, Potsy the elderly barber and his paramour, Charlie Kern – 40-plus and still tied to mama’s apron strings, and a few local homeless. Drinkers who covered the sidewalks from curb to yards and some identified ladies of the night, day or anytime. However they were all a part of what made Dixie Highway and surrounding streets a most memorable and interesting place to live. You could sit on my grandmother’s porch at 874 Dixie Highway or on Gladys’ grandmother’s porch at 914 Dixie highway and see it all on any given night and we did. We laughed a lot, criticized on occasion, gossiped with no guilt and would judge with authority, have a little beer from the beer bucket, and smugly think we knew it all – and in retrospect I think we did. Gladys and I met when we were 10 years old. Our life was centered in the area between Broadway and Oak Streets. In those young years our bounds were close by. If we were out of parental or neighbor’s eyes we were considered not within our boundaries. During the ensuing years, skating, bicycle riding and Parkland Junior High School broadened our world and made us more cosmopolitan, at least in our minds. Broadway. South. The Bond Bread Company, the aroma of baking bread and the free loafs of bread handed out at the bread company, the green delivery trucks. Near the corner of Maple Street the Penick’s house was a gathering place for a great group of friends: Nancy, Alan Lutz, Tommy Duddy and the two of us, among others. Spin the Bottle was the game of choice. Romances were made and hearts broken many times from one night to the next. The Club Rialto was next to the railroad tracks. It was Louisville’s infamous den of iniquity where women of questionable character, booze, gambling, weapons of choice and a few bodies that mysteriously appeared on the railroad tracks were part of the mystique. The operators were assorted Al Capone wannabes. Off Dixie on Howard was the Independent Ice House. We grabbed shavings and ice chips on hot summer days to chomp on and to cool our foreheads. The sign “cool your watermelons for a nickel” was heeded by many neighbors. We had ice signs to put in our front window so the ice man would stop and bring us ice for our ice boxes. Also on Howard was Catherine Clark’s Beauty Shop where I had her shave my hair off. I did it because I was mad at my mother, but I was sorry later when she looked at me and cried. Ah, youth. The corner was where the police call box was. Our assigned police rode in Car 42. Our policemen were Joe Lally and George Booker. They were friends with everyone, and were not too hard on kid pranksters. They had very little crime to worry about. They also bought home brew from my mother. It was her cottage industry. Across the street was the Dawn Bakery where the salt rising bread was an aroma from heaven if you liked salt rising bread or a terrible odor if you did not. The 4am baking of donuts sent rapture through the neighborhood. Glazed or powdered, both were heavenly. Garland, on the east side was also a busy corner. Schrieber’s Drug Store was favorite hangout for the dudes of the day. Poey Kalus, Augie Kraft, Raymond Duvalle, Jimmy Day, and the two most handsome fellows, Joey Thompson and Bill Key were regulars. Bill and Carl Schrieber were the store owners with their Papa. The sundaes with marshmallow topping and nut toppings were legendary and served up in later years by Bill’s girl friend Ethel. They definitely were a item, even after Bill swung his golf club too close to Ethel and knocked most of her front teeth out. Sadly the jerk still did not ask to marry her. The array of penny candy was huge – it took hours to spend three cents. Also, on Garland East, we had Potsy Auerwick’s barber shop where Potsy cut hair. There were other shenanigans on a regular basis there – but that is for a later post! The casket company was also on that side of Garland. We didn’t mess around there much. The guys played mumblety peg and softball in the street most every night. Mink’s brewery was a favorite area. Much went on back there. It was off limits to most of us who lived west of Dixie Highway. Unsavory stories, real or embellished circulated about that old building. On Garland just a half block from Dixie was the fire department and their training tower. This is the street we lived on for quite a while after the distillery took my grandma’s house at 874 Dixie Highway. After the ’37 flood the entire area was covered with mud. It left a residue of mud on everything and completely destroyed my collection of George Raft photos. My heart was broken. Back to Dixie Highway where Lillie Wolfe lived and gave piano lessons. Two doors south is where Gladys lived, 914 Dixie Highway with her mom, brother Milton, uncle Earl and her Grandmother Lou Jacobs. Lou was about as real as a grandmother could get. My wonderful Grandmother was a lavender and lace grandmother. Lou was an in-touch grandmother, so savvy, and a real sweetheart. She was a great substitute grandmother, so much so we named our youngest Tara LOU. For Gramma Lou. The Brown-Forman distillery was across the street from our house. (The Junior Pundit adds that it eventually took this house and the one on Garland that mom moved to!) My mom was the office cleaning lady for the distillery. It was also my first job. I emptied the waste paper baskets and dusted everything I could reach. Mom paid me 1.00 per week. I felt very rich. Mom taught me to save 10 cents of my weekly pay. It was a wonderful lesson I learned at an early age. 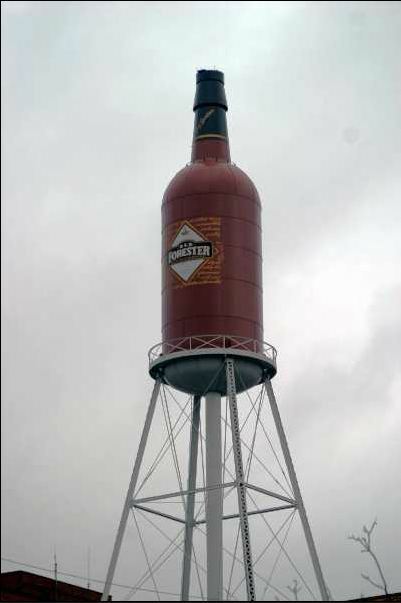 We also sat on our front porch and watch workers construct a huge bottle on a platform way up in the sky. It is still standing high on that platform. Moving on South on Dixie we had a Brooks Brothers, a 5 & 10 and Pearl’s Salon. Around the corner on Kentucky Street was California elementary school, my school. It had great fire escapes to slide down, round and round we slid until we reached the bottom. Patrol boys were stationed at the exit door to help the girls out, but the girls knew they were more concerned about seeing the girl’s skirts fly up as we shot out the escape door. Mrs. Snodgrass, the fifth grade teacher, was standing with the patrol boys one day when she became aware of why they all wanted the “job”catching the girls. All the kids really liked the school janitor, although it was rumored that a janitor had killed a little girl in the boiler room and was never seen again. If it was true, it’s too bad she missed going to the candy store next to the school. The last place at the corner of Oak Street and Dixie Highway was the place we got lost in – the Oak Theater – where our world revolved on its axis to a place of fantasy. It is where I first fell in love with George Raft, where Gladys watched the Broadway Melodies of 1938 and imagined she would be the next Eleanor Powell dancing with George Murphy or the next Ginger Rogers dancing with Fred Astaire. We watched Bill Boyd in his white hat (which never came off no matter how rough the fight) shoot the bad guys in black hats who were burning the widow’s house down. Sadly though, George Raft was not to be for me and, although Gladys did a wicked Dark Town Strutter’s Ball, she never made it on the stage of The Big Broadway. This is just a sampling of our world from Broadway to Oak Streets. There were so many good times, a few questionable times, but always more to enjoy than not. We thought we had it hard at times – moms can be such a pain in the……but that never changes. All in all it was a good life growing up together. We got along great, we fought like two cats, and told each other we didn’t want to see each other “ever again.” Ever again lasted anywhere from ten minutes to maybe a day and then it was past history, sort of like Broadway to Oak Street is today. I would suggest to moms and grand moms to record the neighborhood you grew up around. Your children will cherish the smallest details and appreciate knowing your life as a child and the neighborhood that was a part of your life. 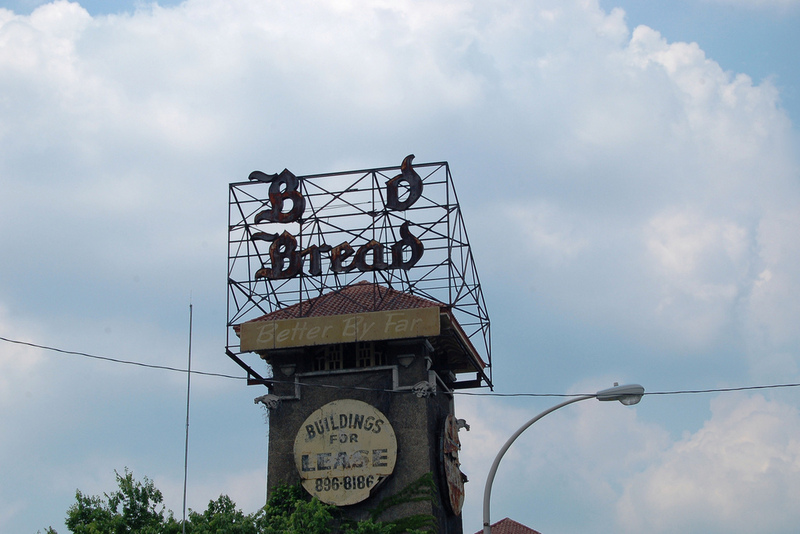 This entry was tagged 1930s, Bond Bread, Braodway, Brown-Forman, Club Rialto, distilleries, Dixie Highway, Garland Avenue, louisville, Oak Street, Victory Park. Bookmark the permalink. This is unbelievable. Until I was about 5 yrs old I lived in an alley behind Brown Forman. We then lived at 942 & 940 Dixie Hwy. My mother had the Dumas Beauty Shop in our home. My parents lived there until we made them move for their own safety, in the 80s. So much of this is so familiar. I remember the groceries you mention which we frequented daily. I have 3 brothers. Myron, Bernie and Milby Dumas. I am Charmaine Dumas. My Grandfather was a policeman until 1942. My Dad, brothers and me were and are musicians. There is a group on facebook called – I Grew Up in the West End of Louisvile who love to share these old stories. They would have a ball with you. I loved your blog. Thank you. I forgot to say, the Oak Theater and Rekers, all part of my childhood and teens. I relate to so much in here. I put this on the ‘I Grew Up in the West End of Louisville’ group on facebook. They will love it. This is a great blog. 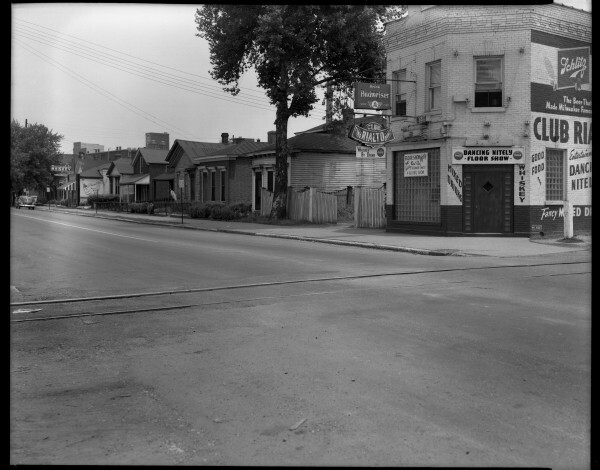 My family lived on 18th street across from the club rialto (two houses from the railroad tracks and B F distillery) from the early 1940’s to 1953. My dad was a miller at B F. We had seven kids in our family. I went to California Elem and remember sliding down the fire escape. I was the baby of the Clark family (born in 1947), but I still remember all the places you mentioned. My sister use to take me to the Train station on Broadway to bum nickels. We use to stand by the railroad tracks when the trains went by our house and the engineers would throw money or bubble gum to us. We had our family picnics in Victory park. I use to play in the giant vats of tobacco on the dock of the cigarette factory. One of my few friends lived over top of the Rialto night club. We use to climb up on the cookie factory roof behind our house. We would routinely go to the movies every other weekend or so. I grew up at 23rd and Kentucky Streets diagonally across from Victory Park, where I spent a big part of my childhood in the 1950s. My husband (Ed Smith and sister Elberta) along with their cousins (Buddy and Betty Smith) lived at 918 So. 18th St., which was later Five Star Cleaners. We both attended Parkland Junior High School and graduated from Shawnee High in 1965. Thank you so much for your memories. They made me laugh, cry and go to a place in MY memory where I relived so many wonderful emotions. Thank you again for bringing back these wonderful sights, sounds and tastes of a place I wish everyone could have experienced. Looking through my father’s memorabilia, I came across a postcard from the Club Rialto, 829 Dixie Highway. The feature performer was Stepin Fetchit. He starred with Will Rogers in the movie “Judge Priest”. Know anything about Club Rialto, and the dates? As the daughter of Gilbert Weller, the owner of Weller’s Market, I lived all of my life, until I left for college, at the corner of Date and Dixie Highway, or 18th St., if you prefer. Dad closed the store in 1975, one year short of his 40th anniversary. My brother, Paul, and I were greatly relieved. Dad and Mom retired to the Highlands. Mom, Thelma, died in 1985; Dad lived alone until 2009 when at age 95 he no longer could do so and spent the rest of his life in Arizona where he died at 96.5 but was returned to Louisville for burial. My brother Paul who worked in the store for many years when he was in high school and college is retired and living in Arizona. Hank Ellert worked in our store. Joe & Gus Reker along with their son, Bob, have passed away. Jim and Aggie MacPherson lived across the street from us. I attended California Elementary which had the great fire escape. When the PTA had a fund raiser, you could buy rides on the fire escape. My brother and I spent many Mondays at the Oak Theatre. We would meet my grandmother who lived at 1627 Oak Street–she was one of the earliest residents having moved there near the end of the 19th century–her house stills stands unlike Dad’s store, etc. I had my first date at the Oak Theatre. When we were in Louisville in 2010 for the funeral we visited the California neighborhood. The California association has erected a marker at the corner of Kentucky St. & Dixie Highway and the block is a small park. I stumbled on this site while I was searching for a recipe for Dawn’s chocolate breakfast. My mom was a regular customer of your Dad’s store! We were good friends with Joe, Gussie, Carl and Bobby Reker. We lived at 1814 Garland just four doors from the Fire Department. I remember seeing you in your Dad’s store often. You were a little girl. I am almost 91 years old so you were some years younger than I. Good Ole Dixie Highway. I remember it with such fond memories. The 5 and 10 cent store, Mamie Hulsmeyer’s dry goods store and those wonderful hot glazed donuts from Dawn Donut bakery. It is so nice to connect with those who remember that great place. Although I was young when it closed, I remember the store. Dad got a set of drawers that had been in the store. I think it held thread. He used it while he had the store and when he retired, I got it. Joe and Dad were competitors in name only. As the warehouses and the meat company raising the size of the order required for delivery. Joe and Dad along with the grocer at 17th? and Garland would combine orders. The Rekers and the Wellers attended dances together. After Dad retired, he and Joe played 3 par golf. Were you aware that the head, possibly now retired, of Humana was David Smith who grew up living I think in the house next to Dawn Donut? As I recall, the fire house was on the other side of 18th and Garland. It was and I think still is the busiest fire house in Louisville.